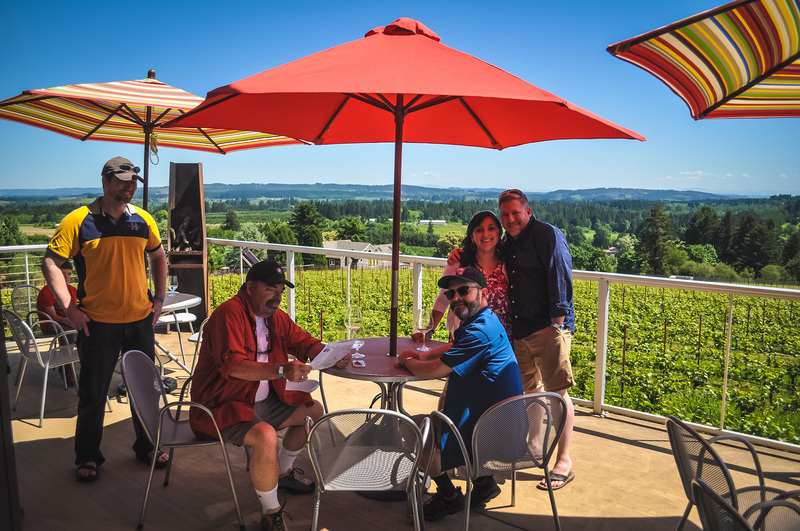 This year’s Covered Bridges Tour was all new. We wanted to see bridges we hadn’t seen before, and Lane County has a nice grouping southeast of Eugene. 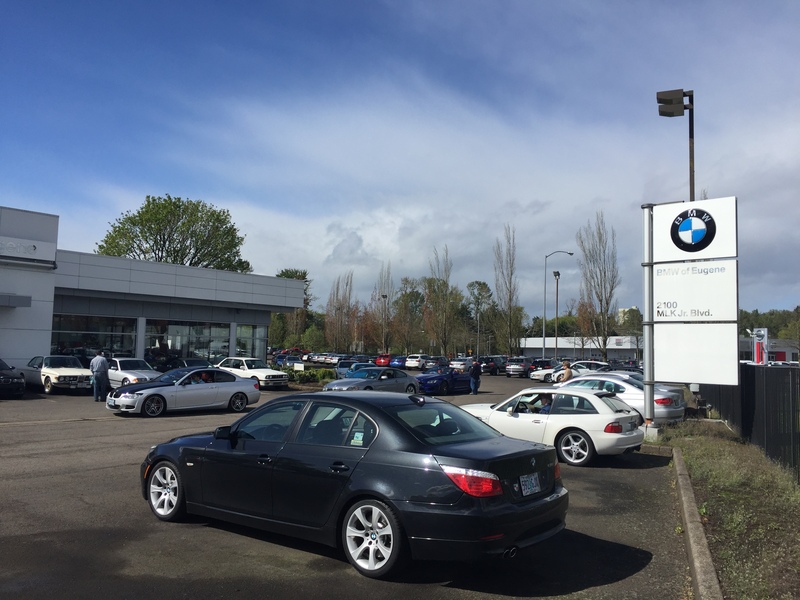 I enlisted the help of BMW of Eugene to serve as the start for our event on April 22. Stan Mayhew, the General Manager, graciously opened his doors for us and made us feel welcome. 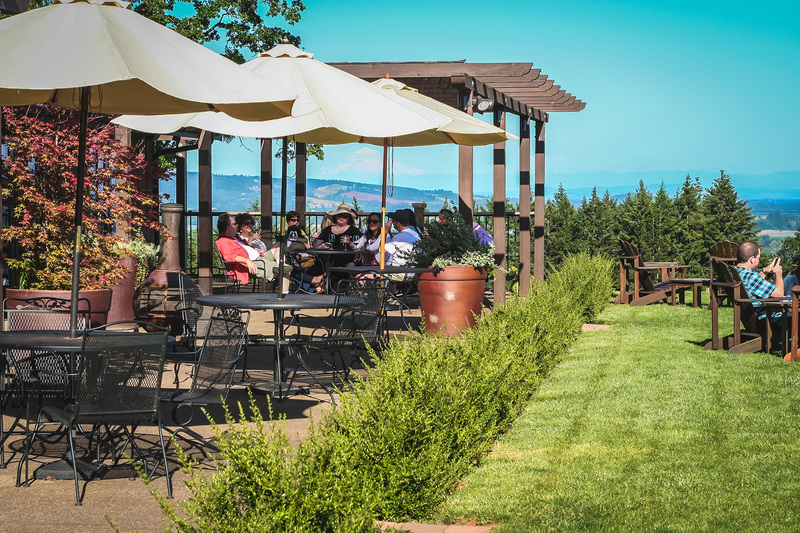 We also wanted a drive that would appeal to the people who live in central and southern Oregon. Registration stats said 39 cars and 45 people, but the weather forecast called for rain. In fact it poured buckets from Salem to Brownsville on my drive down from Portland! When I got to Eugene, Abu Reynolds cleared a large area in front for our group to line up. It was impressive, and it was not wet in Eugene! People came from all over. Steve & Natalie came up from Ashland in their 2017 750i. Arthur & Judy came down from Yacolt WA in their 1995 840ci. We had a great mix of BMW history represented. I received help leading groups from Cory and Brian. We each ended up having about 11 cars. We had a quick drivers meeting and headed out. 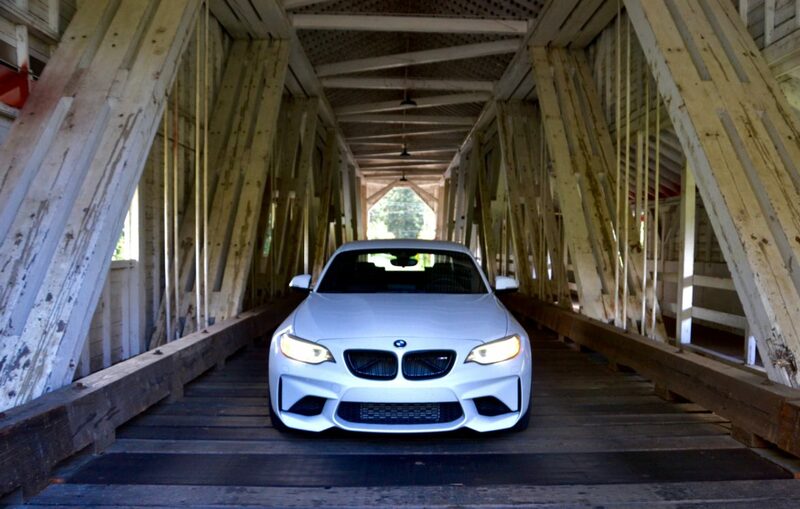 From BMW of Eugene, we drove southeast out to Parvin & Lowell Bridges. Out on Dexter Lake rowers were getting ready for the Regatta competition later that day. Then we drove out to Westfir. The Middle Fork of the Willamette River was our guide. There were sun breaks and no rain all morning. Office Bridge is one of the grandest covered bridges I have seen. When we all drove over the red bridge, there was a surprise waiting for us. 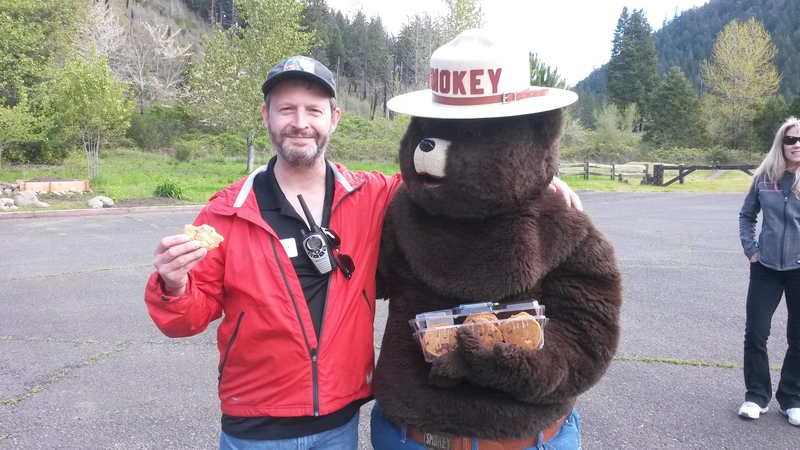 Smokey the Bear was there passing out cookies! We lucked out by arriving when the forest rangers were giving a talk about healthy forests. Dan Hones shot a great video of us coming back out of the bridge – see it on our Facebook page. Driving back on OR-58 I thought they should call this the Willamette River Gorge! It’s so beautiful. The drive to Unity and then to Pengra Bridge features curvy two lane country roads we all love to drive so much. Then we ate a delicious lunch at Hole-In-The-Wall BBQ. People were impressed with the food even if it took a little longer to get. After lunch we said goodbye to those that had to go. It was nice meeting so many new people. About 15 cars remained to do the three bridges left going North. This was a rain soaked section but it didn’t matter. 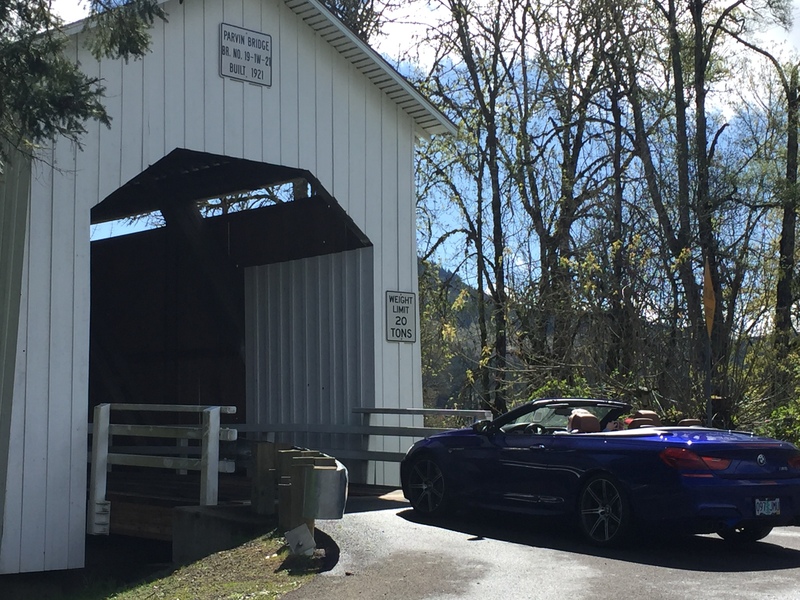 This was another successful Covered Bridges Drive.